Festivals are always fun and no one does Festivals better than the Chinese. Of all the Chinese Festivals, the Moon Cake Festival or Mid-Autumn Festival is specifically aimed at families and in particular family reunions. As the full moon rises. families meet together. They watch the glowing moon rise, eat moon cakes and sing moon poems. The Moon Cake Festival takes place on the fifteenth day of the eighth lunar month - around mid-September - at the autumn equinox. Thus it may also be refereed to as Mid-Autumn Festival. 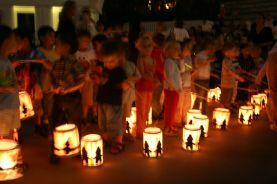 It may also be known as Lantern Festival due to children carry lanterns to celebrate the sighting of the moon. 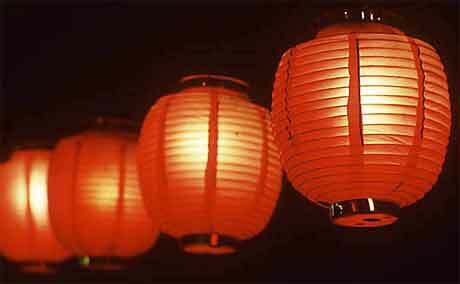 These lanterns are made in traditional Chinese shapes like rabbits, carp, butterflies, lobsters and star fruit however modern shapes on planes, rockets and ships may also be spotted these days. Much legend, mythology and folklore surrounds this festival, which adds to this festivals appeal. In China, the moon symbolizes beauty and elegance - and a trusted friend. And ancient folklore brings us the story of the moon maiden. While several version of the story exist, this one is my favorite. Chang-O a beautiful lady, was the wife of the Divine Archer Hou Yi - the most skilled archer of the emperor. One morning ten suns magically appeared in the sky. This made the land very hot, and the folk were concerned it was cause a massive drought and all would die. So the emperor instructed Hou Yi to shoot down nine of the ten suns. He did so and his superb marksmanship was rewarded with the elixir of Life. Concerned that Hou Yi would become a tyrannical ruler, Chang-O stole the elixir. After drinking it, she floated up to the moon, where she still lives to this day. So when you look up at the moon this Moon Cake Festival and you just might see her dancing on the moon. The most intriguing legend of the Moon Cake Festival takes us back to the 14th Century. During this time the Chinese people were being ruled by the Mongolian people. And understandably they were unhappy about submitting to foreign rule. So a rebellion was planned. Meetings were banned and it was impossible to rally people together to form an uprising. However Liu Fu Tong, a patriotic revolutionary came up with a plan to spread the word of a uprising against the Mongolians. He had thousands of moon-shaped cakes filled with lotus paste made. And received the blessing of the Mongol emperor to distribute these to his countrymen. However, along with lotus paste, each cake also contained a piece of paper with a message telling the Chinese of the planned revolution. The rebellion succeeded and was the birth of what became known as the Ming dynasty. And also possibly the birth of giving Moon Cakes at the Autumn Festival. What ever the real reason for the festival or for giving the cakes, it is a fun time to look up at the moon and remember friends and family. And, could it be that the Moon Cake was the inspiration for Fortune Cookies? www.Chinese-Fortune-Cookies.com your definitive site for everything about Fortune Cookies.